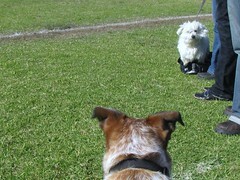 This morning I went with HH, TBU and Pumpkin to watch Moo play soccer. It was a good game, but I was more interested in keeping my eye on this little fluffball named Zac. His humans weren’t too keen on letting me get any closer … I don’t know why … I’d already had breakfast! Oops, did I say that out loud? TBU forgot to get my drink out of the car, so HH took me for a walk to get it. 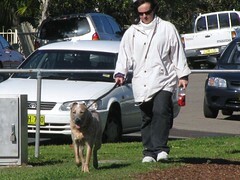 Actually I think I might have taken her for a walk! When we got home, there was a visitor waiting for me. 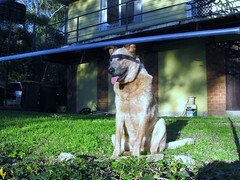 A German Shepherd named Loogal. Everyone said he is my new friend, but for some reason I didn’t trust him in My yard. So, that meant I had to follow him where ever he went and make sure I did a pee where ever he did one. 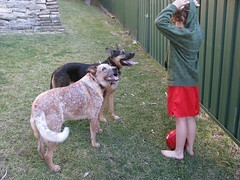 We had fun playing in the backyard with Moo. We thought we would help him with some extra soccer training. I must say that Loogal seems to like soccer training more than I do. He didn’t seem to want to stop, so I found a good viewing point and just watched for while. The sun was very bright though, so I used the railing to shade my eyes. I’m not dumb you know! Loogal is 6 years old. I think he must be a bit deaf, ’cause I stood next to him and barked in his ear for about 3 hours, and he didn’t even seem to hear me! We hope you had fun at the soccer match. Did they let you play? 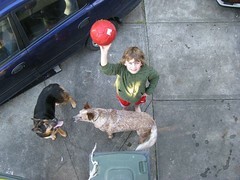 We had a soccer ball once but somehow Keiko managed to put a hole in it and then Toby and Norman peed on it, so it wasn’t much fun after that. Loogal and you had a wonderful time aye! 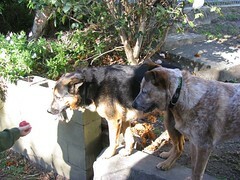 I can relate to the deaf thing.. 2 deaf red heelers now that ain’t no picnic. I am constantly having to keep my eye on them.. Thanks for the invite. We would love to come and visit. Although I may have to chase that soccer ball. 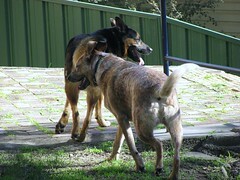 Cool weather would be so awesome about now..
Soccer and a visiting German Shepherd all in the same day. You are a lucky dog. Hope you had fun. Hope you had a great time at the soccer match. I bet Loogal was a fun pal! I agree that soccer with that GSD looks way more fun than an afternoon with that canine cotton ball. I also must weeble over any spot my brother goes. It’s my world, you know? I need to mark it! BTW, thanks for adding the smilies to the comments section…they weren’t always here…or were they? Oh my dog! I am so absent-minded! Great idea to use the railing to shade your eyes. That way you could keep an eye on Moo in case Loogal stole the ball. It still so strange to me to see you all wearing coats in the middle of our summer/your winter. Glad you had a nice day watching Moo playing. Too bad you were not allowed to get closer to Zac but at least you met Loogal! How funny that Zac’s pinkies didn’t want you getting any closer…they just don’t realise what a great dog you are. Looks like you had a good time with Loogal. Looks like you were a great host for your new pal Loogal. And of course you had to pee every where Loogal did, you must keep your yard under your control! Great use of the railing to shield your eyes from the sun. I probably would have used it to dance the doggy limbo. Loogal might turn out to be a good friend. Specially since he didn’t bark back after all that barking. Maybe that cute fluffy one is really nasty sometimes and that’s why her humans didn’t want you near her. I look (very) cute but sometimes I growl at new doggies. A bad habit.